For CTC Northampton, our “parent group” is CTC Northamptonshire & Milton Keynes. This is the parent group for CTC Kettering and CTC Milton Keynes as well as ourselves. On Sunday 4th November, our parent group holds its AGM at the A5 Rangers Club-room on Watling Street in Towcester at 10.30 a.m. We meet for refreshments at 10.00 a.m. and, when the meeting is over at noon, we go for lunch to “The Butcher’s Arms” in Greens Norton. Everyone is very welcome. You will find a link to the Agenda towards the bottom of CTC Kettering’s home page. If you would like to cycle to the meeting from Northampton, there will be a ride led by Bill Simpson starting at Hunsbury Hill Library (Overslade Close, East Hunsbury, NN4 0RZ) at 9.00 a.m. Bill can be contacted on 07736 600858. We will cycle from the meeting to Greens Norton and cycle home after lunch. There was a healthy-looking group of seven riders who braved the start of the cold weather for yesterday’s dash round the ‘hills’ out Teeton/Creaton way. It was good to ride with some of the triathletes from Antoinette’s club – hope they come again! Legs were beginning to ache as we hit the last bank – the short 18% but tough slope at back of Teeton but a coffee stop at Brampton gave us the real ‘hit’ we needed! Come and join me on Saturday 27th October at 9.30 a.m. at the start of the Brampton Valley Way (near “The Windhover”) for a brisk (category B) club ride. Brixworth, Spratton and Teeton. Home for lunch. This is a deliberately brisk and hilly ride to stretch those legs for winter! The early morning mist in Northamptonshire didn’t bode well for the day, but by the time five of us (Phil Gray, Rowan, Brian, David and I) had met up and reassembled our bikes in the free car park (limited stay Monday-Saturday) in Watlington in Oxfordshire, things had cleared-up considerably. Never one to miss an opportunity, Phil managed to grab a few minutes with a CTC HQ staffer who was part of another group assembling their mountain bikes in the same car park. Mountain biking does seem to be quite popular in the Chilterns, based on the number of muddy cyclists we saw out on the roads. Pleasantries concluded, it was time to head out on the route. Out of the car park, turn right and straight up 400 feet of hill. Well, we had to get up there sooner or later. First stop was the village of Turville, or Dibley as it’s known in TV land, with views across to Caractacus Potts’ windmill before picking up signs for the Chiltern Cycleway, which I’m sure is local slang for “hills”, and crashing the route of a 10k road (running) race that appeared to be in its final stages in Frieth (Buckinghamshire). Another climb (and a vineyard) later and we were back on the top of the hills riding through fallen leaves and traditional woodland before plunging down onto a well-surfaced cycle path and into Henley. Where we got lost. I should mention, in fact, that not only were the locals in Henley very friendly and helpful in directing us to the excellent café at the River and Rowing Museum, but the local motorists seemed to be a lot more considerate than we’re used to as well! Recaffienated, and with sense of direction restored, we set off for lunch at the Reformation in Gallowstree Common. A brief ride of a few miles to a pub where they really know their food. After lunch it was off through more of the traditional woodland, past some suspicious-looking satellite dishes and up a “Quiet Lane” (whatever that is; it was pleasant though) to a well. A 360+ foot well, the money for which was provided by an Indian Maharajah to benefit the inhabitants of the village of Stoke Row. From there it was mainly downhill for the remaining few miles back to Watlington where we returned, a little later than expected, to our cars. All in all, an excellent day out. I believe the mileage was a little less than we normally cover on a day ride, but with so much new stuff to see, it’s hardly surprising that we made a full day out of it and I’d like to thank Phil for putting such an interesting route together. The rest of you missed out. 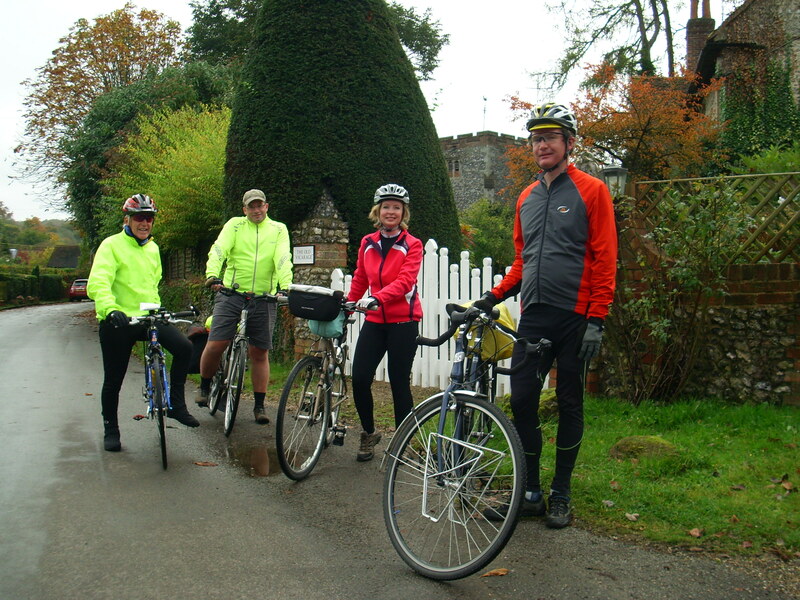 This Sunday, 21 October, CTC Northampton is offering a special, car-assisted Autumn ride through the Chiltern Hills, in an area of great natural and historic interest. 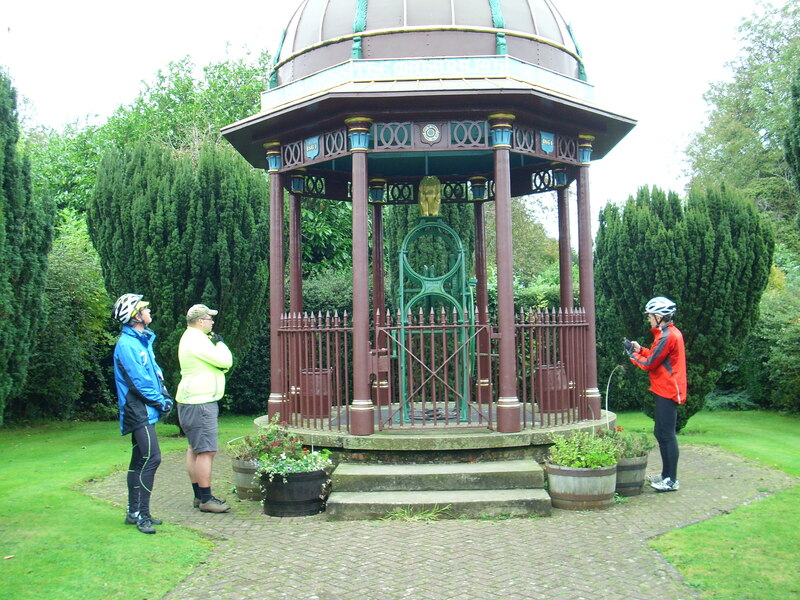 This ride will take in two national Sustrans routes, the Vicar of Dibley’s village, the Chitty Chitty Bang Bang windmill, two ancient drovers’ routes and of course the Maharajah’s Well. And did I mention the hills, which give this area a special beauty – and challenge? If you plan to come or would like further information please let me know (01604 720522; 07724 778215; chairman@ctc-northampton.org.uk. One or two car places may still be available. I had signed up for one of the Sunday rides on offer yesterday at CTC South Bucks’ “Nearly Golden Beeches Weekend” based at St Leonards near Tring. And an adventurous day it was! I’d thought that travel from Northampton to Tring would be straightforward on London Midland and had studied the printed timetable. Going south would be on one train; coming north at the end would be two trains with a change at Milton Keynes. Then I checked London Midland’s website on Saturday. No trains out of Northampton on Sunday; a replacement coach service instead. I decided to swap Galaxy for Brompton to make the coach journeys hassle free. Ought I to change my choice of ride? I’d signed up for the longest of the three rides at 47 miles. I contemplated the medium ride – 36 miles but advertised as “hilly”. Forty-seven miles on the Brompton it would be! To get to the coach at Northampton Station meant leaving in the dark and so lights and a hi-viz waistcoat it was. Then, leaving Tring Station in plenty of time to get to St Leonards, I had a puncture just one mile in. Now changing Brompton tyres and tubes is not straightforward. Even for the front wheel, I need to carry the manual with me as everything has to be undone in a particular order and replaced in exactly the reverse way. Thanks goodness it wasn’t the rear wheel! And, of course, the smaller the wheel, the more difficult to lever off a tyre. Anyway, one of the advantages of sticking to the 47-mile route was that I’d planned to ride to St Leonard’s pretty much along the way the ride would leave (South Bucks send route cards out in advance) so that I would, if necessary, be able to meet the riders on the way. I have to tell you that the climb west from Tring Station is an early morning wake up call! However, when I saw the group approach, I did an about-turn and joined them. We went at quite a pace and I thought it was really hilly, especially for a Brommie. God knows how “hilly” the 36-mile route would have been. After a little while, the eighteen riders broke into two groups: a fast and a not-so-fast. Six of us made up the “not-so-fast” group and, to be honest, the hill-climbing was a treat because of the vistas we viewed. Many people will know the Chilterns escarpment at Whipsnade which gave us our best view north. Indeed, I was convinced the route was just going up and down the escarpment all the time. We had late elevenses at Stockgrove Country Park and I felt refreshed. Refreshment grew to pleasure when we turned off the road to pedal for several flat miles along the Grand Union Canal towpath. Our leader promised us a steep climb away from the canal, a descent into Tring and a steep climb to the finish. I was dreaming of the descent into Tring and saying my farewells there. Why should I want to put my body through a second ascent of my early morning climb? Then the dream improved. Just before the promised steep climb away from the canal, a sign on the towpath indicated Leighton Buzzard Station! Why go on to Tring? I made my farewells then and there. Indeed, less that five minutes later I was on the platform at Leighton Buzzard! The route is here. I did take a camera but had not the time nor energy to use it. Resolutions: (1) to sign up for the whole of the Golden Beeches weekend next year, and (2) to take my Galaxy! Midweek rides – any thoughts? First, I’m probably in the “target group” that would enjoy mid-week rides and I should therefore put myself forward for leading one or two. Copy the Sunday rides – meet at 9.30 a.m., ride through the day with stops for elevenses and lunch. Should we stick to one model of ride? Stick to a set day of the week? I’d be happy to offer to lead one or two rides on the Thursday Club model, just sorting out a route between elevenses and lunch. What do you think? I’m hoping for a short but interested discussion at the AGM.